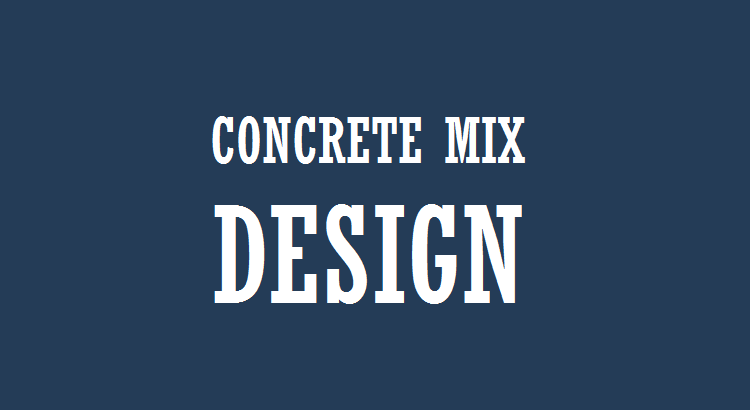 Concrete mix design is the process of selecting suitable ingredients of concrete and determining their relative amounts with the objective of producing a concrete of the required workability, strength and durability as economically as possible. IS 456-2000 has designated the concrete mixes into a number of grades as M10, M15, M20, M25, M30, M35 and M40. The letter M refers to the Mix and the number to the specified 28 day cube compressive strength of the mix in N/mm2. The mixes of grades M10, M15, M20 and M25 correspond approximately to the mix proportions (1:3:6), (1:2:4), (1:1.5:3) and (1:1:2) respectively. The quality of concrete depends on a number of factors and the standard mix just gives us a rough estimate of the quantities of material required. Therefore, standard mixes may be used only for very small jobs, when the 28-day strength of concrete does not exceed 30 N/mm2. Designed mixes are specifically prepared to get the minimum strength stipulated by the Structural designer. These concrete mix are designed with the knowledge of the materials, site exposure conditions and standard of supervision available at the site of work. Further, the site engineer is required to make the concrete at site, closely following the parameters suggested by the mix designer to achieve the minimum strength specified by the structural engineer. The purpose of designing a concrete mix is to achieve the stipulated minimum strength and durability to make the concrete in the most economical manner. Since the cost of cement is many times more than the cost of other ingredients, attention is mainly directed to the use of as little cement as possible consistent with strength and durability. Following are the factors that need to be considered while designing concrete. As per IS456:2000 the following quantities are dependent on the type of concrete (i.e. Plain Cement Concrete or Reinforced Cement Concrete). Values for the above quantities have been provided in Table 5 of IS 456:2000 for different exposure conditions. The characteristic strength is defined as the strength of material below which not more than 5 per cent of the test results are expected to fall. The minimum grade of concrete for plain and reinforced concrete shall be as per Table 5 of IS 456:2000. Concrete of grades lower than those given in Table 5 of IS 456:2000 may he used for plain concrete constructions, lean concrete, simple foundations, foundation for masonry walls and other simple or temporary reinforced concrete construction. 25 kg for rounded gravel. Table 2 of IS 10262:2009 gives the value of maximum water content per cubic meter of concrete. This value is dependent on the nominal maximum size of aggregate and slump of concrete. The water content in Table 2 of IS 10262:2009 is for 25 to 50 mm slump range. or the desired workability (other than 25 to 50 mm slump range), the required water content may be established by trial or an increase by about 3 per cent for every additional 25 mm slump. Different cements, supplementary cementitious materials and aggregates of different maximum size, grading, surface texture, shape and other characteristics may produce concretes of different compressive strength for the same free water-cement ratio. Therefore, the relationship between strength and free water-cement ratio should preferably be established for the materials actually to be used. In the absence of such data, the preliminary free water cement ratio (by mass) corresponding to the target strength at 28 days may be selected from the established relationship, if available. Otherwise, the water-cement ratio given in Table 5 of IS 456 for respective environment exposure conditions may be used as starting point. Mild: Concrete surfaces protected against weather or aggressive conditions except those situated in coastal areas. Moderate: Concrete surfaces sheltered from severe rain or freezing whilst wet. Concrete exposed to condensation and rain. Concrete underwater continuously. Concrete in contact or buried under non-aggressive soil/ground water. Severe: Concrete surfaces exposed to severe rain, alternating wetting and drying or occasional freezing whilst wet or severe condensation. Concrete completely immersed sea water. Very Severe: Concrete surface exposed too sea water spray, corrosive fumes or severe freezing condition whilst wet. Concrete in contact or buried under aggressive subsoil/ ground water. Concrete exposed to coastal environment. Concrete may be placed by hand or by using pump. For more workable concrete mixes which is sometimes required when placement is by pump or when the concrete is required to be worked around congested reinforcing steel , it may be desirable to reduce the estimated coarse aggregate content determined using Table 3 of IS 10262:2009 up to 10 per cent. However, caution shall be exercised to assure that the resulting slump, water- cement ratio and strength properties of concrete are consistent with the recommendations of IS 456:2000 and meet project specification requirements as applicable. Periodical checking of workability and strength. Where there is deviation from the above, the site is said to have fair degree of supervision. At such site we could expect greater variation in the test results and thus the values given in Table 1 of IS 10262:2009 shall be increased by 1 N/mm2. 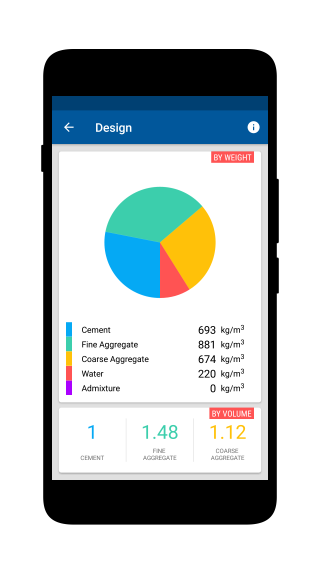 Volume of coarse aggregate per unit volume of total aggregate is based on the grading zone of fine aggregate used to prepare the concrete mix. As the fine aggregate grading becomes progressively finer, that is from Zone 1 to 4, the ration of fine aggregate to coarse aggregate should be reduced. It is recommended that fine aggregate conforming to grading Zone 4 should not be used in reinforced concrete unless test have been made to ascertain the suitability of proposed mix proportions. Aggregates of essentially the same nominal maximum size, type and grading will produce concrete of satisfactory workability when a given volume of coarse aggregate per unit volume of total aggregate is used. Approximate values for this aggregate volume are given in Table 3 of IS 10262:2009 for a water-cement ratio of 0.5, which may be suitably adjusted for other water cement ratios. It can be seen that for equal workability, the volume of coarse aggregate in a unit volume of concrete is dependent only on its nominal maximum size and grading zone of fine aggregate. The maximum size of aggregate should be as large as possible within the limits specified, but in any case not greater than one-fourth of the minimum thickness of the member. Size of the aggregate should be 5 mm less than the minimum clear distance between the main bars. Size of the aggregate should be 5 mm less than the clear cover. The size of the aggregate should be taken as the minimum of the above three parameters. But from various practical considerations, for reinforced concrete work, aggregates having a maximum size of 20 mm are generally considered satisfactory. The minimum cement content and maximum water-cement ratio given in Table 5 of IS 456:2000 apply to 20 mm nominal maximum size aggregate. For other sizes of aggregate they should be changed as given in Table 6 of IS 456:2000. Water reducing admixtures or super plasticizing admixtures usually decrease water content by 5 to 10 per cent and 20 per cent and above respectively at appropriate dosages. The actual reduction in water content should be found out by doing trial mixes and the same should be used afterwards. Specific gravity of admixtures depends on its type and should be determined from laboratory testing. Some of the aggregates are porous and absorptive. Porosity and absorption of aggregate will affect the water/cement ratio and hence the workability of concrete. The water absorption of aggregate is determined by measuring the increase in weight of an oven dry sample when immersed in water for 24 hours. The ratio of increase in weight to the weight of the dry sample expressed as percentage is known absorption of aggregate. The aggregate absorbs water in concrete and thus affects the workability and final volume of concrete.Corrective measure is taken so that the water/cement ratio is kept exactly as per the design. Extra quantity of water needs to be added to the final mix equivalent to the absorption of aggregate. If the aggregate contain surface moisture they contribute extra water to the mix and thereby increase the water cement ratio. Corrective measure is taken so that the water/cement ratio is kept exactly as per the design. Quantity of water equivalent to the free (surface) moisture present in aggregate needs to be subtracted from the final mix. Where sufficient test results for a particular grade of concrete are not available, the value of standard deviation could be taken from Table 1 of IS10262. The lower value of the water-cement ratio given in Table 5 of IS 456 for respective environment exposure conditions and the limiting water cement ratio for the requirements of durability may be adopted. 2 of IS10262. The water content in Table 2 of IS10262 is for angular coarse aggregate and for 25 to 50 mm slump range. Form the results of the above two steps the cement content could be easily calculated. The calculated cement content is then to be checked with the maximum and minimum cement content prescribed in IS456. 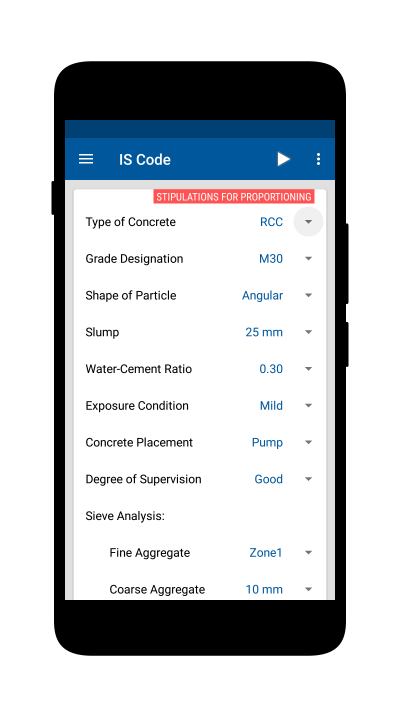 For the given nominal maximum size of aggregate, we can calculate the ratio of volumes of coarse aggregate to the volume of total aggregates for different zones of fine aggregates from table 3 of IS10262. Subtracting this from one would give us the ratio of volume of fine aggregates to the volume of total aggregates. The theoretical design mix should be validated with laboratory test results using trial batches of concrete. The first few batches need to satisfy the workability criteria and if not satisfied a change in water content has to be done. After the desired workability is achieved, the concrete is then checked for strength.